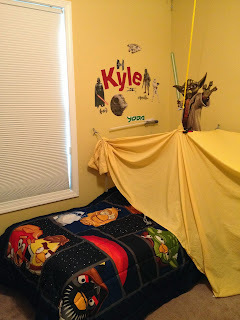 I remember being very sad when the K-Man decided he wanted to choose the decor of his room. It was so cute with this vinyl cling of construction trucks and his name, that I had bought on Etsy. But he received as a gift some vinyl clings of super heroes, and of course, they had to go somewhere. Down came the trucks and up went the new characters. He has since switched themes at least 4 times. I have actually decided he is done. We are staying with the theme of Star Wars/Angry Birds, no matter what other things he gets into for awhile. We will go broke trying to keep up with the new big thing. And I also have that little issue of liking things to go together. So we couldn't have Star Wars bedding and some other character on the wall. LOL And yes that is a tent over his bed. It was a fort kit from his Aunt 2 years ago now, I think. The fort went up and never came down! It has now come to be Mini-Me's time to sort of choose her decor. We were testing the waters with the crib switched to a toddler bed, but it was time to move to a big bed. My sister's family is to be blessed with twins this winter, and the crib is being paged to bigger and better days. So Mini-Me moved to a big girl bed this weekend. As an enticement from the toddler bed, we, of course, offered new sheets. To her delight, she is now sleeping on Princess sheets, or as she refers to them as "Sleeping Booty" sheets. We already had some gifted wall clings in a Princess design that I was holding off on because I wasn't ready for her to call the shots on decor. The poor little space above her bed seemed so bare though, so I relented. The tree and birds are still up adjacent to the Princesses. I am not quite ready for that to go. I thought this was a fine compromise, except when I went to put the black comforter on top of said sheets, Mini-Me about came undone and promptly pulled it off. I guess I have to break down and buy the darn comforter too now. Oh well, the great thing is she is more than content to sleep solidly in her new big girl bed... even took a 3 1/2 hour nap yesterday! You can tell from the smile, that she likes it just a little. It is just crazy how fast these things happen :o(.